Pep Guardiola insists that Kelechi Iheanacho won’t be going anywhere in the transfer window despite the arrival of new striker Gabriel Jesus. The Nigeria forward was left out of the Manchester City squad for last Saturday’s 2-2 draw with Tottenham Hotspur with Gabriel taking his place in the bench. League and FA Cup matches in the second half of the season. “We have seven strikers, three in the middle, four or five wide — normally we play two or three,” Guardiola told a news conference ahead of City’s FA Cup tie with Crystal Palace. “I don’t know how many others play. We play five or six offensive players and thanks to that we create a lot of chances. Guardiola admits he faces a difficult balance keeping the players in his squad happy. Spain forward Nolito, who joined in a £13.8 million move from Celta Vigo in the summer, is another who has fallen down the pecking order — starting just one of City’s last seven games. 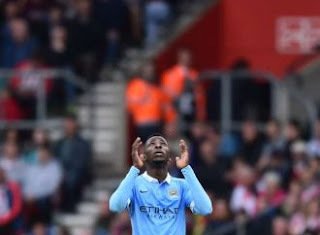 “Jesus and Nolito are not-so young strikers, Gabriel, Rash [Raheem Sterling] and Kelechi, they are so, so young strikers and they will be the future. They have to adapt,” Guardiola added. Guardiola said that there will be no new signings in the transfer window although he said a member of his squad could be on his way out. He said he is happy with squad and didn’t feel the need to add any more players in the January transfer window. “Disappointed? No, I am so happy with the squad,” he said. Young defender Tosin Adarabioyo, 19, is a reported target of Everton while midfielder Fabian Delph has been linked with moves to Leeds United, Aston Villa and Newcastle United.